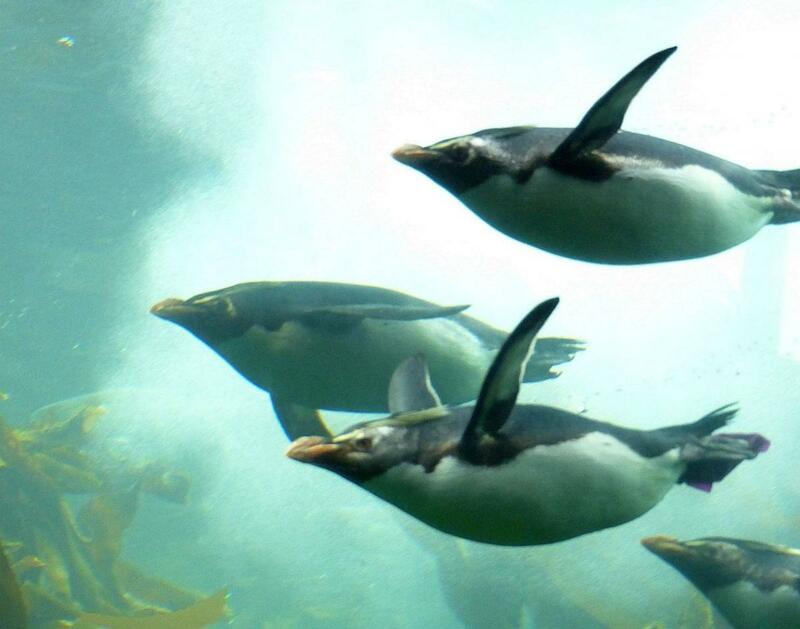 The flightless penguins are the most marine of birds, spending more time at sea than any other group. 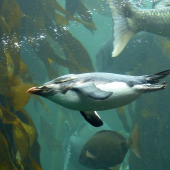 Moseley's rockhopper penguin is one of eight species of crested penguins, all of which occur in the New Zealand region as either breeders or vagrants. 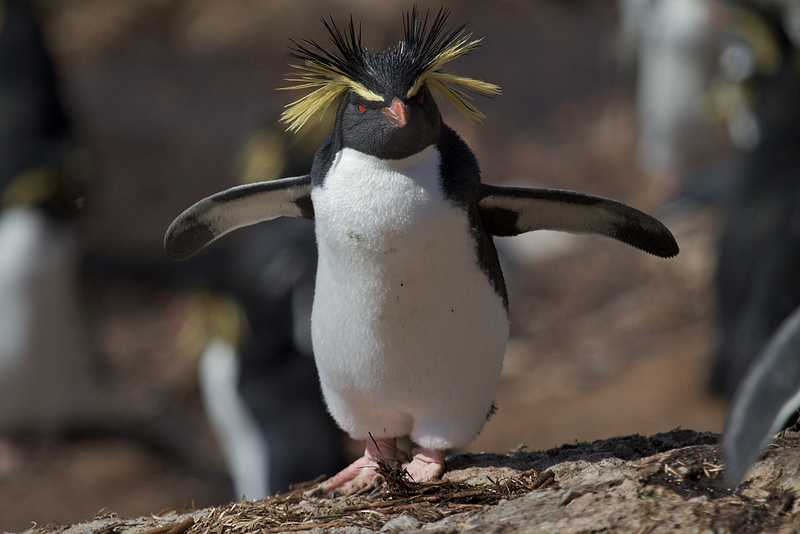 Moseley's rockhopper penguin has the most spectacular crests of all, with improbably long yellow crest feathers reaching from behind the eye down to the upper breast. They are classified as Endangered by the IUCN Red List due to very rapid population declines over the last three generations (30 years), throughout its range. 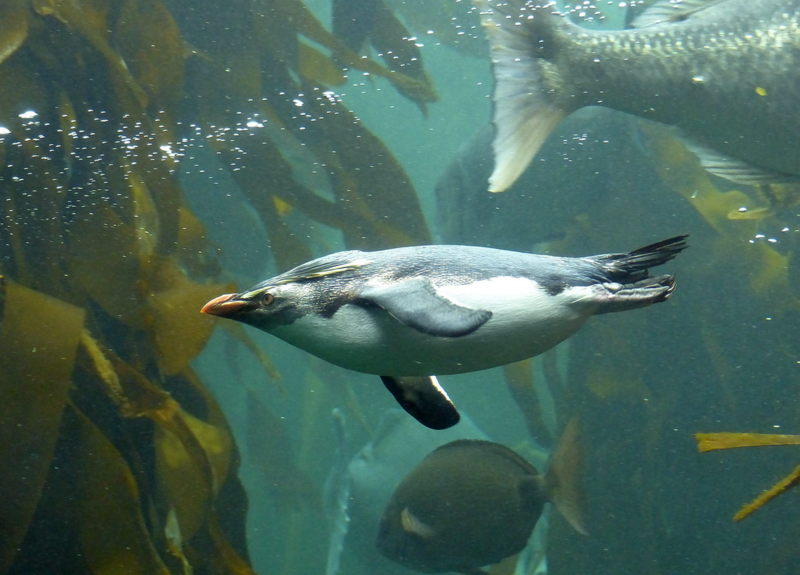 Moseley's rockhopper penguin can dive down up to 100 metres depth to pursue prey, and can remain submerged for over 2 minutes. When ashore, it stands upright to walk and hop on powerful pink webbed feet. Highly social birds, they gather in large colonies to breed on the coasts of subantarctic islands. Adults are medium-sized, stocky black-and-white penguins with multiple long golden-yellow crest tassels growing above each eye and spiky black feathers across the back of the head. They have a narrow golden-yellow stripe above each eye, chunky reddish-brown bills and brilliant red eyes. The head, flipper-like wings, back, and tail are slate-grey to black; the underparts and 'trousers' are white. Their feet are pink and their flipper-like wings grow up to 19 cm long. The sexes look alike but males are heavier with larger bills. Juveniles lack the elongated crests of adults. Voice: the adult repertoire includes noisy aggressive squawks and raucous braying and trumpeting that varies between individual birds. Adults recognise chicks by their individual "cheep" calls. Similar species: Moseley's rockhopper penguins are slightly larger than eastern and western rockhopper penguins, and have much more luxurious and longer crest tassels. 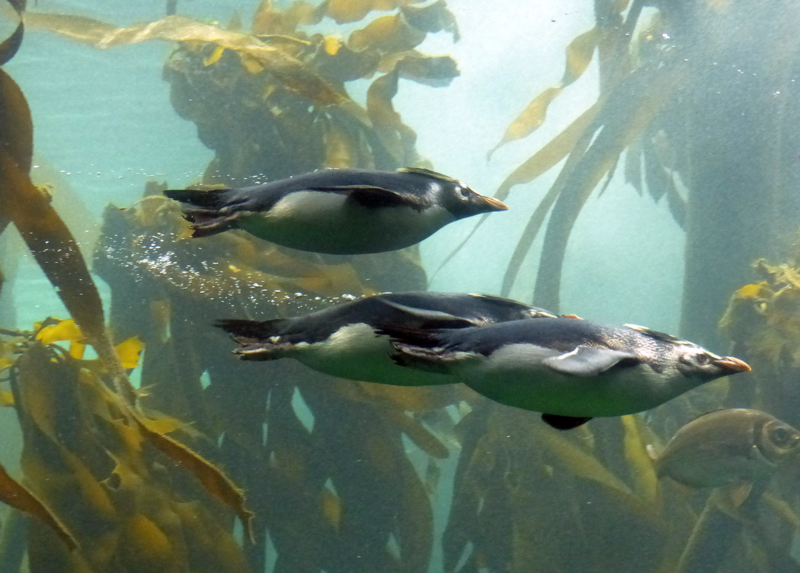 No other crested penguin has crest plumes that reach well below the black-white demarcation line on the throat. 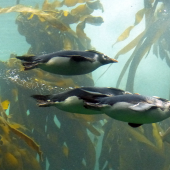 Moseley's rockhopper penguins inhabit the southern Indian and Atlantic Oceans where they have a restricted breeding range, occurring at just seven subantarctic islands with a total land area of 250 km2. Most breed at Gough Island and islands in the Tristan da Cunha archipelago (UK), the rest breeding at Amsterdam and St Paul Islands (France). They are thought to disperse to seas north of their breeding islands outside the breeding season, but their precise movements are poorly known. 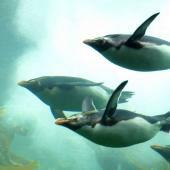 Moseley's rockhopper penguins have been recorded from the coasts of South America, South Africa and Australia in winter, and at least three birds have reached New Zealand. The latest global population estimate is c.270,000 pairs. Latest estimates for Gough Island and the Tristan da Cunha archipelago are 83,000 pairs at Middle Island (2009), 64,700 pairs at Gough (2006), 25,000 pairs at Nightingale (2009), 54,000 pairs at Inaccessible (2009) and 6,700 pairs at Tristan (2009). In the southern Indian Ocean there is an estimated 24,890 pairs at Amsterdam Island and 9,023 pairs at St Paul Island (France). At Gough Island the population declined by c.2 million pairs (98%) between 1955 and 2006, and at Tristan da Cunha by hundreds of thousands of pairs in the 1870s, reducing the population to around 5,000 pairs by 1955. Breeding colonies at Amsterdam and St Paul islands have declined by 40%. Population modelling indicates that over the previous 37 years (3 generations) numbers declined by 57% . A single Moseley's rockhopper penguin built a nest on Rangatira Island, Chatham Islands in August 1968, and was present at the same site in November 1970. A second bird reached the Chatham Islands in February 1993 (Pitt Island); what was presumed to be the same bird was seen at several sites on Pitt Island and nearby Star Keys at least once per year through to at least January 2004. The only other accepted record from New Zealand was a bird that came ashore to moult at Moa Point, Wellington in January 1984. The IUCN Red List classifies the northern rockhopper penguin (=Moseley's rockhopper penguin) as Endangered (A2) due to very rapid population declines over the last three generations (30 years), throughout its range. The exact causes of decline are poorly known, but changes in sea temperature, competition for food, incidental capture and drowning in commercial fisheries, and predation by introduced predators are implicated. For example, commercial fisheries and egg collecting are known to have caused significant mortality. In 2011, the cargo carrier M.S. Oliva ran aground on Nightingale Island, spilling oil that reached nearby Inaccessible Island, and also Tristan da Cunha Island over 30 km away. Thousands of penguins were oiled, resulting in 3,000 being removed from the wild for hand cleaning. Moseley's rockhopper penguin is a colonial breeder at temperate islands in the southern Indian and Atlantic Oceans, where breeding adults arrive between July and August. Colonies are located in a variety of coastal habitats including open boulder beaches on Gough Island, and tussock-covered slopes on Nightingale and Inaccessible islands. Indian Ocean yellow-nosed mollymawks are present within colonies at Amsterdam Island. Noisy courtship displays involves much trumpeting, squealing, barking and 'quivering' calls, accompanied by head-nodding and bowing. 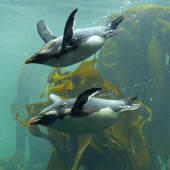 Moseley's rockhopper penguins are monogamous, with pair-bonds maintained over successive seasons if both birds are present at the colony. The nest is a scrape on the ground usually lined with small pebbles, sometimes grasses. Two greenish-blue eggs are laid, the second larger than the first. Incubation is shared (though the female does more) and takes 33-34 days. Both parents care for the chick until it goes to sea when 9-10 weeks old, with the male doing most of the chick-brooding and guarding. A maximum of one chick is raised per breeding season. 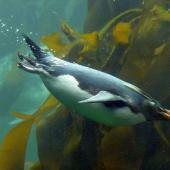 Adults are present at breeding colonies July-March, then are at sea continuously after completing their annual moult. They are gregarious at sea, where birds feed in flocks. Birds often rest and preen after coming ashore, close to landing sites. Adult birds peck and use their flipper-like wings to strike at intruder birds in the colony, sometimes jabbing at them with an open bill and grappling their nape. Non-breeders roost at margins of colonies, breeders roost and moult at nest sites. 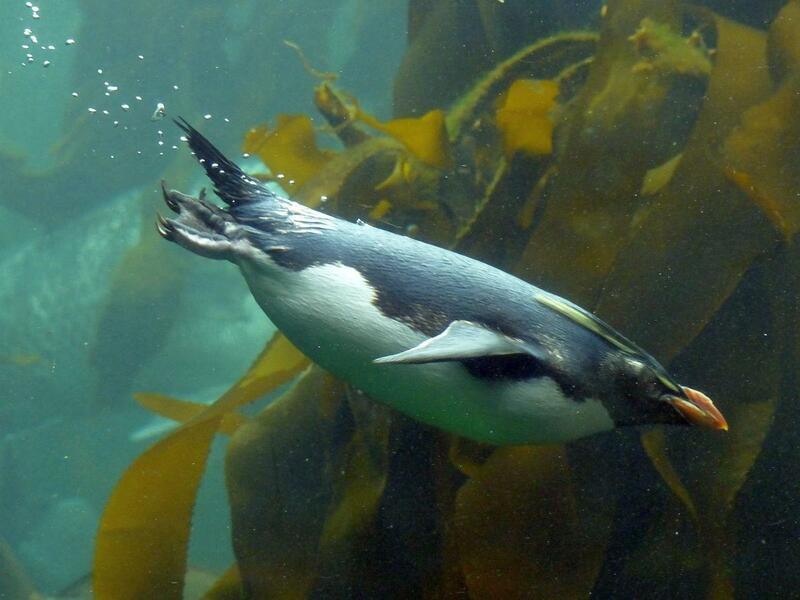 Moseley's rockhopper penguins feed on krill, squid, octopus and fish. Skuas and giant petrels prey on chicks and sick or injured adults. Subantarctic fur seals and leopard seals sometimes take adults coming ashore at colonies. BirdLife International. 2010. Rockhopper penguins: a plan for research and conservation action to investigate and address population changes. Proceedings of an International Workshop, Edinburgh, 3-5 June 2008. BirdLife International. 2012. 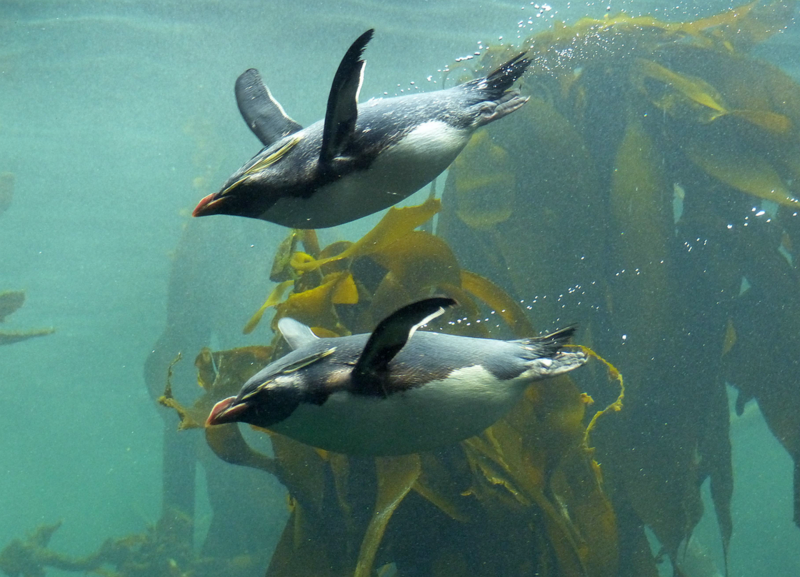 First assessment of endangered northern rockhopper penguins since 2011 oil spill. BirdLife International media statement, 6 February 2012. Cambridge, UK. Heather, B.D; Robertson, H.A. 1996 (rev 2000). The field guide to the birds of New Zealand. Viking, Auckland. Marchant, S.; Higgins, P.J. (eds. ), 1990. Handbook of Australian, New Zealand and Antarctic birds. Vol. 1, ratites to ducks. Melbourne, Oxford University Press. Moors, P.; Merton, D. 1984. First records for New Zealand of Moseley's rockhopper penguin (Eudyptes chrysocome moseleyi). Notornis 31: 262-265. Robertson, C.J.R. (ed.) 1985. The complete book of New Zealand birds. Reader's Digest. Australia. A medium-sized, stocky black-and-white crested penguin with a narrow yellow stripe above each eye, long yellow crest tassels that grow from behind each eye and spiky black feathers growing from the back of the head. The head, flipper-like wings, back, and tail are slate-grey to black, the underparts and 'trousers' are white, the chunky bill is reddish-brown bill and the eyes brilliant red.